Organic photovoltaic cells (OPVs) are, in fact, very complex electric systems and an approach to aid understanding of their electrical properties is to model the devices using electrical components, observe how the model-fit parameters change with any treatment that is applied to the OPV, and to give a realistic and scientific physical explanation for this OPV behaviour. 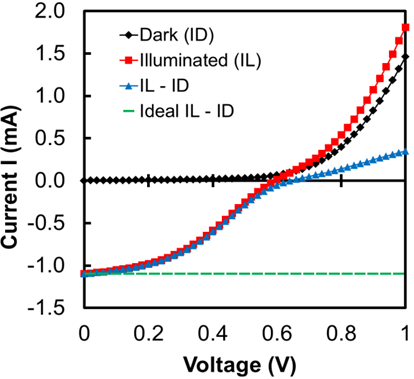 The one-diode model (ODM) or two-diode model (TDM) has been worked well in modelling the normal I-V curve of the OPV. However, the current-voltage (I-V) characteristic of OPV devices sometimes exhibits a kink, often referred to as an "s-shaped" I-V curve. This kink reduces the fill factor (FF), which in turn lowers the power conversion efficiency (PCE) of the OPVs. 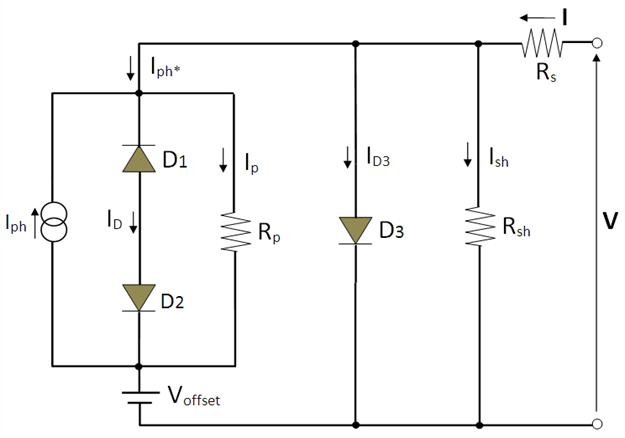 In my project a new equivalent circuit model is proposed by modifying the ODM. This model is able to account for the "s-shaped" I-V curve and to extract their model-fit parameters across the full range of the I-V curve and therefore is of use to probe the underlying physical processes in OPV devices.